One of the issue of Sandbox is decreased visibility because it is put in meta site instead of main site. How can we increase the visibility, especially for the new users? If you are proposing improvement for the Sandbox itself, please post in How shall we make the sandbox work better?, not here. Permanently (?) 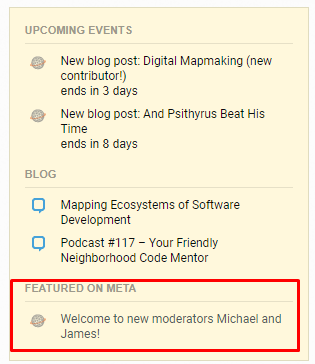 put the Sandbox link to the featured section of the right banner. 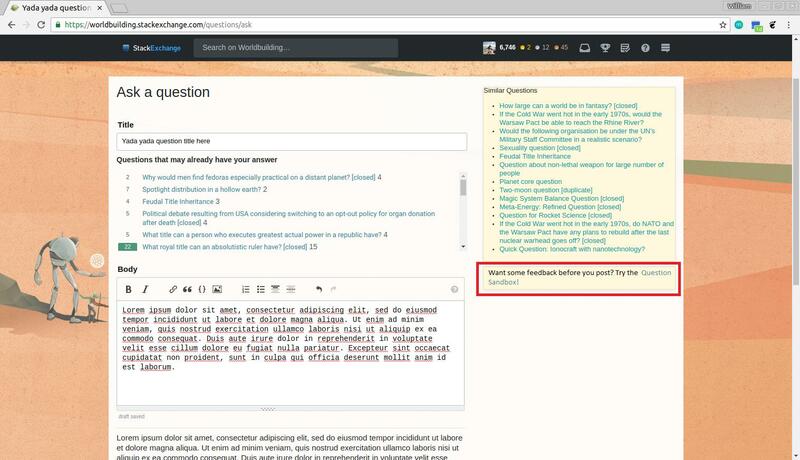 This way everyone will have easier access to the Sandbox, both users (especially new users) and reviewers. Design a community ad to promote it. This idea has come up before, but we've never gotten all the way to an ad design that could be added to the rotation. An ad complements other approaches that are tied to specific graduates. It might reach a different audience by being an ad with a graphic component. Add a link to the sandbox to the help center main page. We have the ability to edit the very top of the help center main page, just below the search bar. That's the same page that gets linked if you write [help] in a comment. While we shouldn't abuse that possibility, that would seem to be a good spot to place links to a few pieces of highly useful and generally applicable meta-content intended to help new users. I could personally see how placing links there to the question sandbox, and the site-specific checklist for questions and (when we have it) that for answers. We probably shouldn't have much more than that there, to ensure that people aren't overwhelmed. That would increase visibility, let others see the relevant discussions and doesn't really require any changes. And it wouldn't clutter the real question that you asked by adding unnecessary meta information. Telling people what ways you used to clarify your question is unnecessary and doesn't belong into the question post. Also not everyone has to do this. It's just a way to increase the visibility for the Sandbox if you were satisfied or are hoping to increase the functionality of the Sandbox. We should make sure that question drafts are not immediately deleted in that case. For example you should only flag drafts that graduated after 24 hours. I propose that we should add a link to the sandbox, in the end of questions that graduated from Sandbox. Graduated ideally should means at least one upvote from more experienced members. But right now I'm stuck on defining the requirements for graduation. 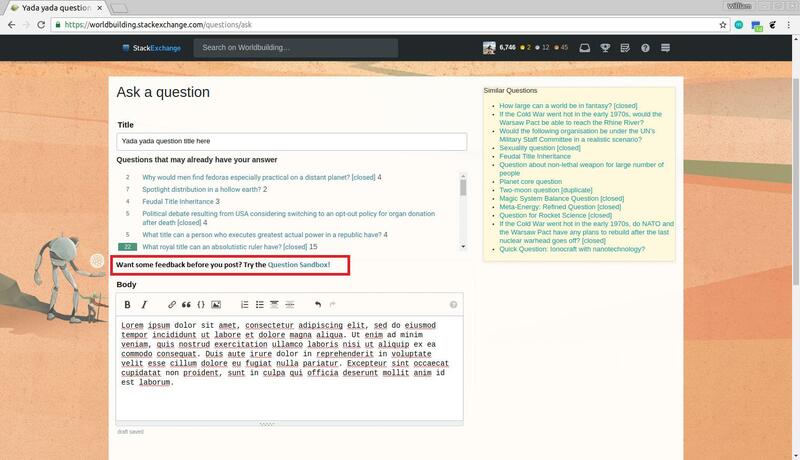 This will let people know that a Sandbox exists for them to prepare a question before posting to the main site. This question was created with help from the "Sandbox". Feel free to propose feedback and suggestion and criticism. Can we add a line to the "Ask Question" page? This seems like the most intuitive place to put a link to the Sandbox, if not a blatant advertisement for it. There are two locations that I think might be good for this one, see mockups below. Monica mentions here that it's difficult to make this change because it's on the SE side of things, but I personally think it'd be the best possible place for a link. Should the rep requirement for Meta be lowered to 1? How do we increase Worldbuilding visibility and activity?